I sometimes feel like a fraud even though I'm not. This fraudulent feeling is often known as imposter syndrome. 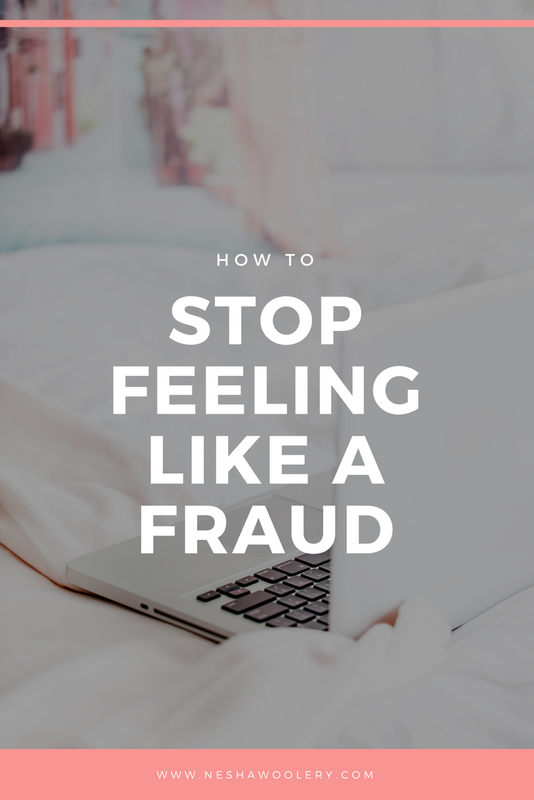 Feeling like a fraud is an icky feeling. Screwing up with a client and feeling guilty, disappointed and stupid because of it. Seeing other designers doing the same amount of work but earning x3 what you earn. Research shows that women feel like frauds more often than men because we internalize things and blame ourselves for every mistake that happens in our businesses. Sound familiar? Sadly, I bet it does. Over the years I've been in business, I've learned a few ways to deal with imposter syndrome. Sure, I still feel like a fraud from time to time. But I know now that I can ride the Fraud Wave and confidently come out the other side! Want to do the same? You are beautiful and unique. You're also imperfect. You're going to make mistakes from time to time and they're going to make you feel like you're a fraud. Just because you feel that way doesn't mean it's true. I wouldn't rush into a Facebook group of 10,000 potential clients and announce that you feel a fraud because that could cause some leads to think you lack in confidence, and it could stop people hiring you. Instead, join a group of other designers and share your feelings with them! When you talk to others who feel or have felt the same way, you hand some of the burden over to them and you instantly feel better. A problem shared is a problem halved! You're welcome to join my Facebook group, The Designer Collective. If you think you're the only creative entrepreneur who feels like a fraud, think again. Even famous creatives feel like frauds! Even a wildly successful designer like her suffers from imposter syndrome sometimes. Even though you're imperfect and you sometimes make mistakes in your business, you also do a lot of things right. Own them. Be proud of your successes. It's all too easy to forget about our successes, but we shouldn't. Our successes are keeping us in business. I like to keep a notebook in Evernote called My Success Log. Every time I reach a milestone or do something amazing for my business, I log it down. Then when I'm feeling bad about myself or my business, I look at the notes in my success log. Works every time! This is similar to a success log. In your email inbox, create a folder called Happy Mail. Then when you receive a happy note from one of your readers or clients, store it in the happy folder. When you're having a bad day its helpful to read through all the wonderful things people have written to your over time. It pushes you to overcome your fraudulent feelings and continue growing your business! Haters are gonna hate (try and read that without bursting into Taylor Swift's Shake It Off, I dare you.) Some people just like being spiteful. Some people despise your success and will look for any mistake they can call you out on. Try not to let it get to you. If you let a hater spoil your happiness, they've pretty much won. So here's the thing: don't dignify hate mail with a response. Simply delete it and get on with your awesome day, because if you don't, hate mail can start causing you to feel like a fraud. Like someone who doesn't deserve all the great things you've worked so hard to have! Imposter syndrome often begins with comparing yourself to others. I've done this myself! When I see Income Reports from people in my industry who are having $8000 months, I feel totally jealous. And that leads to me feeling like a fraud because I'm not making the same amount of money as them, so I feel like I'm doing something wrong. It is sometimes healthy to compare yourself to others because it can push you to achieve more. But try not to focus on others. There's no point in focusing on someone who is at a different stage to you. They may have been in business for 5 years and you may have only been in business for 1. You can't possibly expect to play in their league in just a 1/5 of the time it took them to get there. Focus on self improvement. It doesn't matter what other people in your niche are doing, the only thing that matters is you and your progress. You're a human being who makes mistakes! You're imperfect! Deal with it. We are all imperfect. That doesn't make us all frauds. If you can't shake your imposter syndrome, step away from your screen and take a break. Whether it's just an afternoon coffee break at a local cafe, a whole day spent in front of the TV, or a week away in a peaceful village. It doesn't matter. Just get away from your business and give yourself time to calm down and accept that you're not a fraud. Often, a little break is all that is needed to help you feel better about yourself and your business. I've already said this but I'm going to say it again: you're an imperfect human being. You're going to make mistakes. You should recognize and accept this, and so should your blog readers and your clients. Making mistakes doesn't mean you're a fraud. It simply means you have a issue to fix and opportunities to grow. Embrace your mistakes. When you do, you'll no longer feel like a fraud. You've heard of the saying 'fake it till you make it' right? Here's a little secret: everyone is faking it. No one has everything figured out and nothing else to learn. If someone thinks they do, they're the one who is the fraud. When you feel like a fraud, you usually stop creating stuff because you feel like the stuff you create isn't perfect or viable. That's not true. Even if you feel like you're creating content that is already out there and written by someone else who is ten times better than you, you have to remember that there are lots of people who love your point of view. They want to read what you write because of the unique spin you give it. Don't deny people that. Sometimes you'll get things right. Other things will totally fail (like course launches... Ugh). That's OK! Your business is one big experiment and some experiments go better than others. The main thing to remember is to never give up experimenting. That would be like giving up on finding love because you boyfriend dumped you. Everyone knows it's an unwise thing to do, because that one failure just opens the door for a success later down the line. List all the things you're good at within your business. Maybe it's client communication? Writing awesome newsletters and blog posts? Cultivating a creative community? Helping people? Whatever it is, embrace it. Write it all down. You're an expert at all of these things. A unique expert. Don't forget that. Still feel like a fraud? That's OK. Some feelings are deeply engrained within us and they take a bit more work to eliminate. Go through the 15 steps above and try a few. If they work, come back here and leave me a comment telling me all about it! Share your feelings. I want to hear them! Freelancers and other creative business owners only have so many hours in the day, yet we expect ourselves to complete so many tasks. Have you ever felt frustrated because you haven't crossed off every task on your to-do list? Have you felt hopelessly unproductive because you only completed half of the things you needed to do? Do small tasks suddenly turn into long, hard tasks that take hours? That's hours of time that could be spent finding new clients or creating passive income streams! It's difficult NOT to be hard on ourselves. A lot of pressure comes with running a one-person creative business. But we don't have to do All The Things. If we can automate some of the small tasks that pile up, we can save ourselves time and bucket-loads of stress! Spending more time with your husband and kids! Creating and selling a digital product so you don't just make money from your services anymore. Sounds like bliss, right? Think of all the TIME you'll have to grow your freelance business and live a fuller life. All you have to do is invest a little time right now in automating your business. You can create an autoresponder from most, if not all, email accounts. An autoresponder is an email that automatically sends to everyone who emails you. You can use it to tell people when they can expect to hear back from you, when they WON'T hear from you, when your soonest availability is and more. This is the easiest way to cut down on the number of follow-up emails you get from people who expected to hear back from you straight away. It's also the simplest way to set clear boundaries and expectations in your business! There's a lesson on creating the perfect autoresponder in Organize & Automate, plus a copy & paste script you can use! I recommend creating a reusable project schedule you can use with every client. A project schedule like the one above outlines the timeline of the project. It shows the days and weeks in calendar format and the tasks you're going to complete on each day. It also includes the days your clients feedback is due. To put this kind of schedule in place, just commit to starting each project on the same day (eg. Monday's.) Then follow the schedule for every project you have! My clients never used to provide feedback on time. Ever. It would usually result in their project going weeks over its deadline, and I'd be pulling my hair out with stress. I use a free project management tool called Asana to manage my projects instead of emailing my clients back and forth. Inside Asana, you can have conversations, share files, feedback, calendars and more with your clients! The best thing about it? Everything is organized on one page. Asana also allows you to set a 'due date' for every task you create. This means you can create a task, call it 'Feedback Is Due', assign it to your client and set a due date. Then, a day before their feedback is due, Asana sends them a reminder. Awesome, right?! If you're not sure what Asana is or how to use it, I have a FREE course that will teach you how to use it with your clients. Sign up below! Some freelancers never speak to their clients again after they're done working with them. They just... hand the files over and stop communicating. If so, I hate to break it to you but you're leaving thousands of dollars on the table. If these clients are happy with the work you did, they will most likely want to work with you again! But if you don't keep in touch, they'll probably forget about you. 1. The 3 week follow up. In this email, you check in and see if they are happy with the work you provided, need any more work or have any questions. 2. The 6 month follow up. Check in and keep it more general- talk about how well they are doing and mention great things you've seen them do over the last six months. Then remind them you're there if they need to hire you again! 3. The 1 year follow up. You keep this email really short and simple. Just check in, wish them a happy year and ask if they'd like to work together again. Stay in touch with your clients by automatically adding them to your mailing list so they can hear about future deals or new services you launch. To automatically add a client to your mailing list, you'll need to sign up for a free Zapier account. Zapier allows you to connect apps and trigger automations. 1. Trigger: A client completes their payment via the invoice you send them. 2. Action: Zapier adds the client to your mailing list! Here's an example of how you'd set this zap up in Zapier using two common tools: Freshbooks* for invoicing and Convertkit* for your mailing list. Do you send the same emails over and over again? If so, create copy & paste email scripts to use for milestones within your projects! I have an entire lesson on email scripts in my course, Organize & Automate. There's even a workbook of 11 copy and paste scripts you can start using straight away! Create an FAQ page where you answer common questions that your clients ask. I link to my FAQ page on my contact page so inquirers can see if their question is answered before contacting me. It saves the inquirer time writing a message and it saves me time answering it. I also link to my FAQ page in my email autoresponder, reminding people to head there if they haven't already to get a quick answer to their question. Emailing clients to remind them their payment is due is one heck of an awkward task! Most invoicing systems (like Dubsado* and Freshbooks*, two of my favorites), allow you to set up invoice reminders so you don't have to feel uncomfortable asking for overdue money anymore. The app does it for you! Do you find yourself giving your clients the same instructions and guidelines all the time? How to provide you with helpful feedback. How important timelines and deadlines are. How your payment policy works. What files they need to give you before the project starts. Do your clients email you lots of questions after you've finished working with them? I'm sure you're happy to help them, but it takes up a lot of time. To stop receiving so many questions, create a client portal (or page) on your website. Your client portal could include all the common questions clients ask you, plus tutorials and videos. Since I created my client portal, I've received a LOT less questions from my clients, saving me a lot of time. As I mentioned earlier, I use Asana to manage my projects. Within Asana you can create a project page for each client. 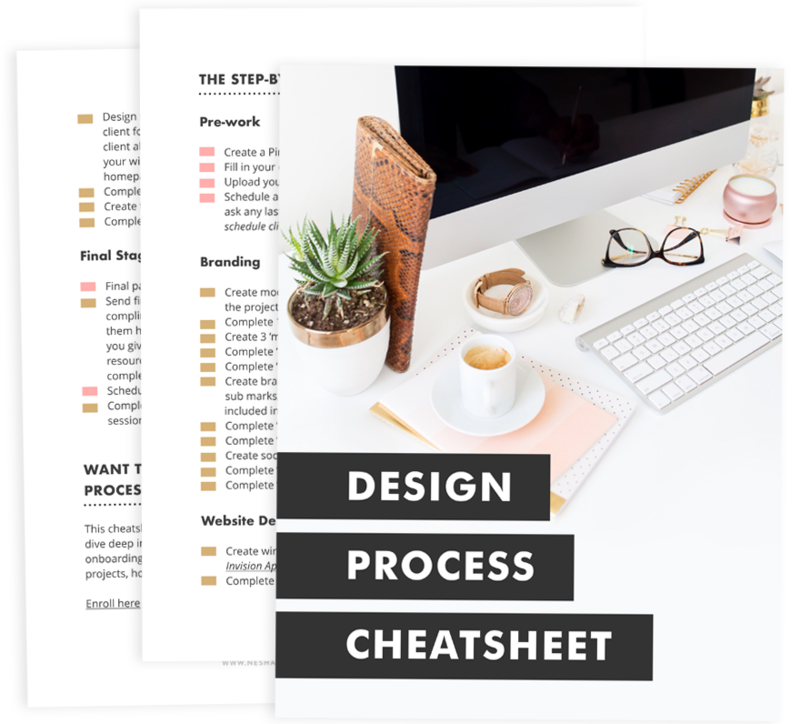 Instead of creating a new page from scratch every time you book a new client, create a project template and duplicate it for every client you take on! Join my free course, Project Management For Designers, to learn how to create a project template! If you still do your bookkeeping in spreadsheets then maybe it's time to switch to using a system like Freshbooks* or Wave. These apps automatically import your sales and expenses. All you'll need to do is categorize them! It's time to stop pulling your hair out as you try and organize a year's worth of expenses from a shoebox of receipts. If you use Wave (it's free!) as your bookkeeping tool, it comes with a free app for your phone called Wave Receipts. Every time you buy something for your business, use the app to take a photo of the receipt and it will store it in Wave! Obviously, logging our receipts can't be entirely automated but this is as close as it gets! 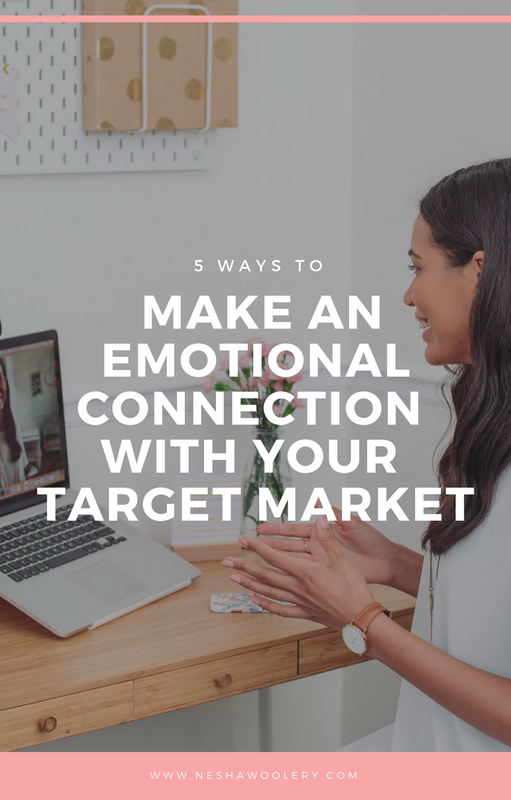 Do you and your clients send dozens of emails back and forth, discussing the best time for you to call each other? It's hard - especially if you live in different timezones! Use a scheduling app like Calendly or Acuity Scheduling*. These apps show your client the times and dates you're available and display those dates in the clients own timezone. Scheduling apps like Calendly or Acuity Scheduling* send automatic confirmation emails and reminders. You no longer need to manually email your client to remind them of your appointment! Scared your clients won't want to use your project management tool to communicate about their project? They will if you train them how to use it! To do this, create a two minute tutorial about why you're using a PM tool and how to use it. No need to train your clients one on one. You can send the same tutorial to them all! Want to learn more about using a project management tool with your clients? Sign up for my free course below! To make sure you never forget to pay a business expense, set up a standing order in your bank account. A standing order is an instruction to your bank account to make regular fixed payments to a particular person or company. Set these up and forget about your bills! You have better things to spend your time on. Stop making your clients print, sign, scan and send your contract. I use Hellosign to automate this process. Hellosign let's you upload your contract and create editable fields for the client's name, address, payment schedule and other details. Each time you need to send a contract to your clients, just fill in the editable sections of your contract inside Hellosign and it will send the contract to your client for their electronic signature! If you use Illustrator CC, there's a really quick and easy way to export all your assets into multiple file types with just a few clicks. It's called the Asset Export window! Learn how to use it inside my course, Organize & Automate. Here's another one for the freelance designers reading this! Stop manually creating moodboards, style guides and website wireframes for every project. If you spend a little time creating templates for these things once, you'll be able to reuse them for years! Do you and your clients communicate through hundreds of emails in dozens of threads? Are your clients constantly late providing files, feedback and payment? YOU need to start using a project management tool with your clients. Using a (free!) project management tool to communicate with clients, share files, create to do lists and set up automatic reminders can eliminate these problems. Not sure which PM tool to use and how to use it? Sign up for my FREE project management course below to learn how to use my favourite tool (Asana) with your clients.